Mon., Dec. 4, 2017, 10:20 a.m.
VALLETTA, Malta – Ten Maltese suspects were arrested Monday over the car bomb slaying of a prominent investigative journalist, the prime minister and other authorities said, about six weeks after the assassination that shocked Malta and drew European Union pressure to ensure rule of law here. 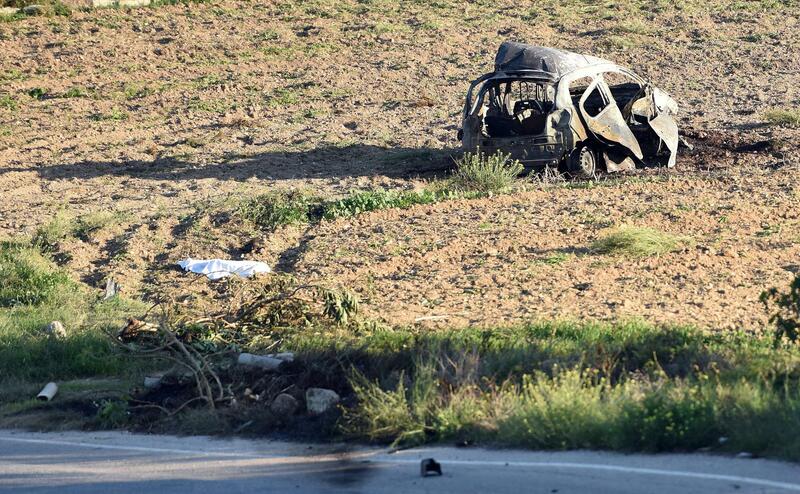 Daphne Caruana Galizia, whose reporting focused heavily on corruption on the EU island nation, was killed Oct. 16 when a bomb destroyed her car as she was driving near her home. Eight Maltese citizens were arrested because of a “reasonable suspicion” of their involvement in Caruana Galizia’s killing, Prime Minister Joseph Muscat told reporters at a news conference. Shortly afterward, he tweeted that two others had been arrested. The two additional suspects are also Maltese, Home Minister Michael Farrugia said. Last month, her family had alleged that Farrugia had divulged confidential information that could hamper the investigation. The minister brushed off the allegation, but the family said it was prepared to take legal action to prevent the government from sabotaging the investigation. On Monday, her family reacted angrily to how the arrests were announced – saying police should have informed the family, not Muscat first – and reiterating in a statement their uncertainty if justice will be carried out, despite the prime minister’s public insistence earlier in the day that all would be done to solve the case. Muscat “appears to view the investigation into Daphne Caruana Galizia’s assassination as a marketing exercise for his government and not as a contract killing, which has left surviving family members wondering what happened and how justice can be truly served,” the family said. They said they had already written to the police commission about “the constant stream of leaks which prejudice the integrity of the investigation,” but never received a response. The investigation appeared to be continuing throughout Monday, as police and armed forces had cordoned off an area in Marsa, a small port town close to Valletta, the capital. The arrests, made in an operation coordinated among the Police Corps, the Armed Forces of Malta and the Security Services, were the first known break in the killing, which has drawn widespread outrage and condemnation. A court hearing was set for Tuesday, when the police can officially file charges. The suspects then can either plead innocent or guilty. The magistrate will decide whether to set bail or remand them in custody. Europol, the European Union’s police agency, has sent a team of organized crime experts to help Maltese police investigate the assassination, joining the FBI and Dutch forensic experts. Muscat told reporters Monday that when the evidence is compiled, during court proceedings “all the relevant information will be made public,” including input from the FBI and European investigators, including from Finland’s National Bureau of Investigation, as well as Maltese investigators. Just before her death, Caruana Galizia, 53, had posted on her closely followed blog, Running Commentary, that there were “crooks everywhere” in Malta. The island nation has a reputation as a tax haven in the European Union and has attracted companies and money from outside Europe as well. Low tax rates and a popular government program that allows wealthy foreigners to buy Maltese citizenship have made the country an attractive place for investment, financial and other companies. Authorities, including anti-Mafia investigators in nearby Italy, worry that Malta is in the eye of criminals on the lookout for money-laundering schemes. The journalist focused her reporting for years on investigating political corruption and scandals, and reported on Maltese mobsters and drug trafficking. She also wrote about Maltese links to the so-called Panama Papers leaks about offshore financial havens. Many top officials had sued her over her reporting. Caruana Galizia made plain she didn’t trust the island’s police or judiciary to adequately investigate many of the wrongdoings she alleged. Published: Dec. 4, 2017, 10:20 a.m.